It’s that time of year again! Valentine’s Day is just around the corner, and Baton Rouge bakeries and restaurants are gearing up for the day of love and romance. Whether you’re planning on spending the night sipping wine at a romantic restaurant, going out with the girls, or watching cheesy rom-coms with an endless amount of takeout (*cough cough* me) we have a few suggestions for some treats that will make the day just a little sweeter. What other V-Day treats have you seen around town? Tell us in the comments! The perfect choice for a cozy night in or before a fun night out, Rotolo’s is offering heart-shaped pizzas all week long. Choose from any of its signature combinations, or build your own pizza with up to three toppings. Have your flowers and eat them too! Cupcake Allie is putting a spin on the most classic Valentine’s Day gifts with these gorgeous flower cupcake bouquets. You can choose the amount of “flowers” and the color too, just make sure you don’t eat them all before you give them to your significant other! Party all week with Doughnuts from District Donuts Sliders and Brews. This week only, the shop is whipping up romantic extravagant doughnuts daily leading up to Valentine’s Day. Check out a new selection every day. While there is a huge variety of Valentine’s-themed treats to choose from at Les Amis, we think these 4-inch decorated cakes really take the … well, cake. The cakes come in different flavors and designs, so you can find the perfect cake for that perfect someone in your life. For the sweetie in your life, these bouquets are the perfect addition to Valentine’s Day celebrations. Each bouquet comes with three red roses, six cookies, three chocolate-covered strawberries and three chocolate-dipped Oreo’s. 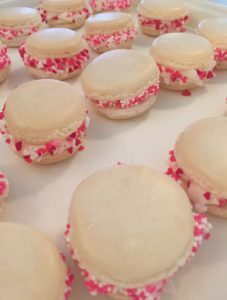 Nothing beats some of Tredici Bakery’s delectable macarons, especially when they are decorated perfectly for Valentine’s Day. The bakery is preparing multiple different flavors of the pastry on the big day, so be sure to grab one (or five) to celebrate. Why pick one Valentine’s day candy when you can get it all with the Be My Valentine Fancy Bark at Gourmet Girls. These treats feature a bunch of different classic V-Day candies, all encased in white, milk chocolate or dark chocolate.